The past few weeks have been absolutely insane at work. It seems as though ever since Mr. Prevention returned from his business trip to China, I’ve spent more time at work than home. It’s a good thing I love my job! The last 2 weeks, especially, have been go-go-go. There were numerous evenings I would work all day, help facilitate cooking classes or diabetes programming in the evenings, and hop in the car around 8pm to drive an hour to hockey. I would play for an hour and head home, 40 minutes. Shower and collapse into bed. It’s ironic that I am actually the type of person that loves to be busy. My ideal work day is jam packed, but my evenings allow time for relaxation, cooking, exercising, and…sleep! But my love for being busy is a spectrum and I’ve been running on fumes. This holiday week couldn’t have come at a better time. I’ve adapted to the lack of time by planning meals that are either quick or that can be made ahead of time. Last night, dinner was made on Sunday and baked last night. Tonight’s dinner I threw together in the crock pot last night and it’s cooking as I type. I’ve always said that I need to incorporate more quick meals and crock pot meals, but I feel like I’ve hit the quick meal/make-ahead meal jackpot lately. And busy or not, who doesn’t love a home-cooked meal without carving out an hour each night to make dinner? Lasagna Soup piqued my interest back when Pinterest exploded with its new popularity. But it wasn’t until Biz’s near demand that her readers make this recipe that I followed suit. I’m not one to argue with Biz…the woman has great taste in food. I know this through the many, many recipes I’ve made based on her suggestion over the years we’ve been blogging and following one another. This recipe was no different. Realistically, this is a one-pot meal ready in 40 minutes from start to finish. 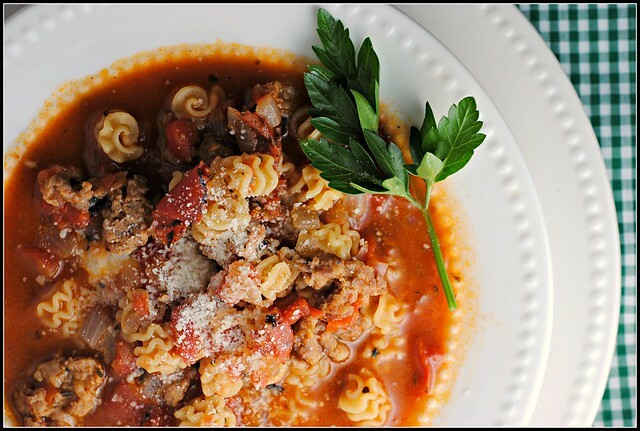 If you have the time, feel free to simmer the broth longer before adding the pasta as the flavor will deepen. 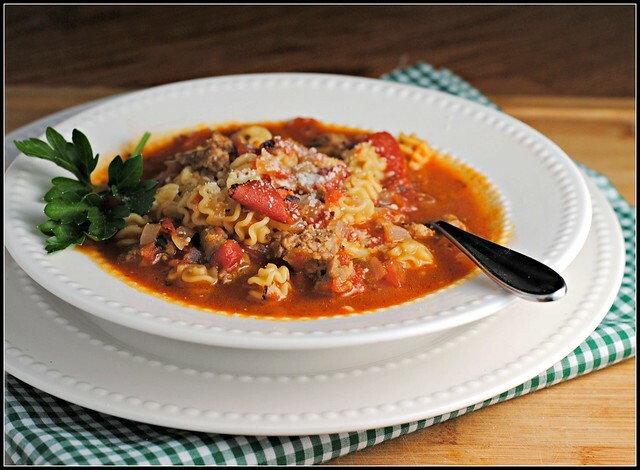 Even without, this soup is flavor-packed and sure to please…just about anyone! Heat olive oil in a large pot over medium heat. Add sausage, breaking up into bite-size pieces and brown for 5-6 minutes. Add onions and cook until softened, about 5-6 minutes. Add garlic, oregano and red pepper flakes. Cook for 1 minute. Add tomato paste and stir well to incorporate. Add diced tomatoes, bay leaves and chicken stock. Stir to combine all ingredients. Bring to a boil and then reduce heat and simmer for 10 minutes. Add uncooked pasta and cook until al dente, about 10 minutes. Meanwhile, prepare the cheesy goodness. In a small bowl, combine the ricotta, salt, pepper, and mozzarella; stir to combine. Add the basil and pepper to the soup; stir. To serve, place a dollop of the cheesy goodness in each soup bowl and ladle the hot soup over the cheese. Result: A new favorite soup? I immediately added this to next week’s menu at the hospital…I think the staff and visitors will be ALL over this one. The cheesy goodness is shockingly amazing. Very simple, but quite the touch to really make this soup resemble lasagna. Mr. Prevention gobbled this up and gave it 2 thumbs up, as well. Quick to make and a one-pot meal. Kid-approved, too, I’d have to imagine! If you don’t have the fresh basil, skip that part or add a teaspoon of dried. Enjoy! Two days til Turkey Time! Yay for one pot meals! 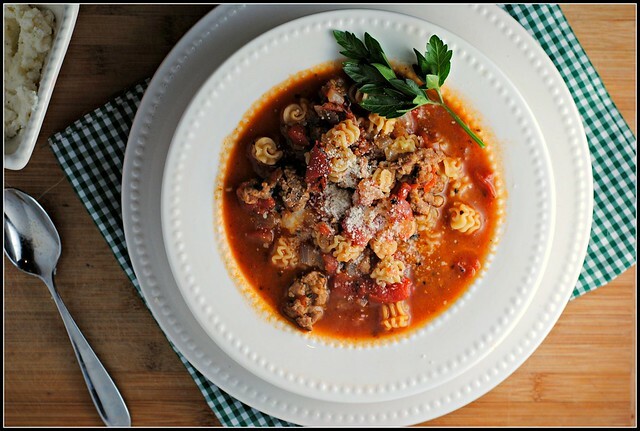 This lasagna soup looks incredible (and like something I never would have thought of!). It’s meals like these that are perfect for those crazy busy days. Good luck with work, Nicole! It’s funny because I think my roommate pinned the same recipe? I know what you mean- the holiday needs to get here. I’m running on lack of sleep and it’s not getting better any time soon… meh! Hooray that it made the menu at the hospital!! 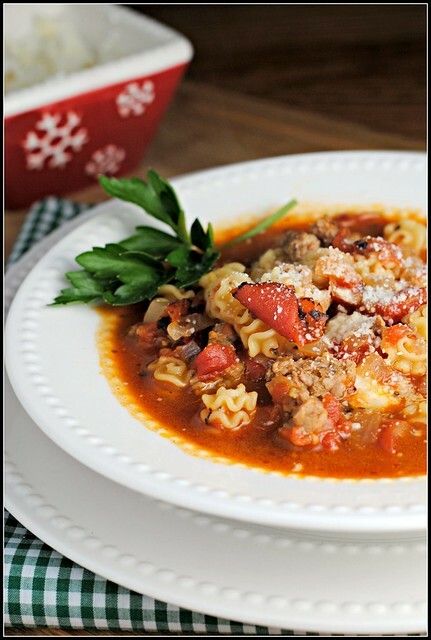 So glad you liked it, and I love that you used turkey sausage and I love your choice of pasta – so pretty! This soup delicious..and so unique!!! The lasagna soup I’ve made is one of my favorites, so I can only imagine that this is good too. Yep, this has been on my “to make” list too! Love Biz and this soup looks amazing…definitely going to have to get it made asap! Looks like your soup turned out nicely. I bet it would even work to make a meatless version. I am sure if I was in the States I would have more options for veggie sausage to use, but it may work with skipping it altogether. I am glad that you are enjoying your job, even if it is busy. I know the feeling. I just picked up an extra day at WIC here on base so things have gotten busier for me too. Hope you have a wonderful Thanksgiving. Happy Thanksgiving to you and your family Nicole! 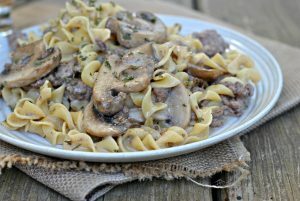 I keep seeing versions of this around the blogosphere and have been meaning to try it – looks delicious! Happy Thanksgiving! I notice that you often use turkey sausage links with casing removed, rather than plain old ground turkey sausage. Is there a benefit to using the links and removing the casings? I’ve always subbed ground turkey sausage because it seems easier to me. Am I missing some great nutritional or flavor benefit? P.S. I made this soup tonight. Yum! Ah, that makes sense. Thanks! Made this recipe tonight and it was so very good! Thanks for sharing. Definitely going to make again and it was so easy and fast to prep and cook. Love 1 pot meals. I definitely want to give this recipe a try. I think it could be a healthier alternative to one of my childhood favorites – Hamburger Helper Lasagna. And, it just started snowing outside, so I think it might be a good night for soup. I made this tonight and it was great. My husband even said he liked the sausage in it. Great, easy dish. Thanks! This is sooooo yummy……………….and totally easy…im new in the kitchen and LOVE thissssss….can anyone tell me if it freezes well? I made this for my “I hate soup wife” and she LOVED it. Even took some for lunch the next day. I’ve also made it for a church soup supper and now a number of women are making it all the time. Thanks for this great recipe! Hi Ed! That is WONDERFUL! 🙂 Thanks so much for sharing that…made my day! I’ve made this a few times since my first post, but my ” I HATE soup wife” asked me this week when I was going to make it again! You have no idea how special that is! Maybe since it was 35 degrees and windy this morning in So Cal has something to do with it. BTW, the answer is TONIGHT! I can’t thank you enough. I made this soup tonight for dinner and it was fantastic! My boyfriend and I both loved it! It was the perfect thing to make on this snowy evening at my boyfriend’s where the oven is broken so a real lasagna is definitely out of the question. Thanks for the great recipe (as always)! This is by far my favorite dish. It has become my signature, go to dish. It is so easy to make that even I can’t screw it up, and it is so very delicious. 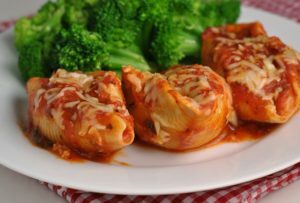 I’ve been making this recipe since you first posted it. It’s a family favorite!